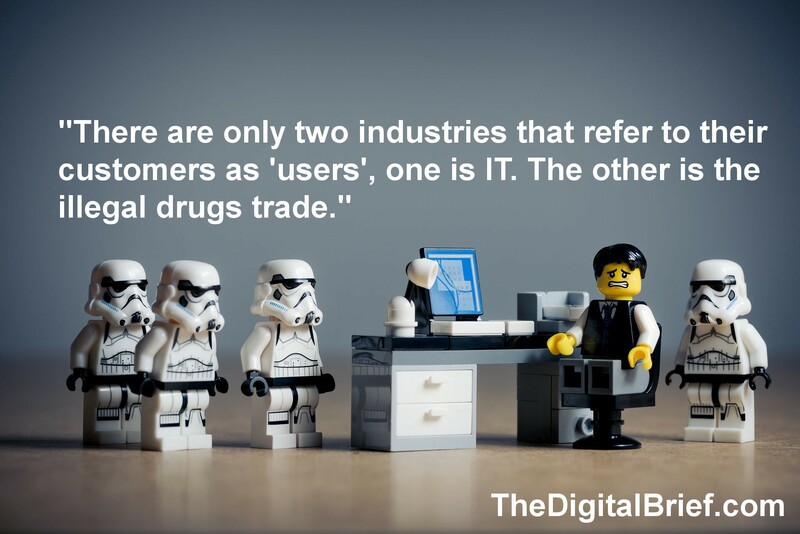 There are only two industries that refer to customers as ‘users’, one is IT, the other is the illegal drugs trade. I was once told the above and I will leave this to your interpretation but I would suggest that IT’s traditional view of ‘users’ can have a major bearing on the degree of adoption and ultimately the level of success your IT strategy will deliver. If we simply view end-users as those to whom we apply change then those end-users will simply feel that ‘change is happening to me…’ None of us like change where we are not able to influence it or feel part of it. Therefore, in order to influence and onboard those who will ultimately benefit from our strategy, we must take a different approach. So let’s drop the somewhat archaic and passive term ‘users’ or ‘end-users’ and refer to them as they should be ‘customers’ or perhaps even better ‘partners’. This is even more important if you are responsible for delivering a strategy that involves staff who are devolved from your organisation but will ultimately become a beneficiary of your strategy. How do you plan your engagement in a way that will motivate and make your devolved ‘partner community’ want to get onboard or, even better, become impassioned about it? As humans, we generally enjoy being part of a team where we feel like we are adding value and are seeing success. Creating an environment where people want to join in and be involved is essential, but this often requires a pattern of success on your part for people to gain confidence. Identifying ‘quick wins’ in your strategy that will add value to your community today, not in year 2 or 3, will help to build such confidence. Simple commendations can also make a huge difference to peoples motivation so never hold back from providing an honest ‘well done’ to anyone who has delivered on your strategy or to anyone in your devolved ‘partner community’ who has taken the time to care enough to provide valuable feedback or input. The real trick to keeping a ‘partner community’ involved and engaged though is to trust them. Trust is one of the most influential and powerful tools you can use. Empowering people to own and assist in delivering your strategy can make a real difference to the degree of success realised. This does not mean however that you simply hand over work packages and the like and wait to see what happens! The most successful relationships are forged by trust and such relationships thrive on frequent and productive communication preferably face-to-face. Having a clear and well aligned IT strategy is, of course, important but you need to consider the softer ‘relationship strategy’ as well to underpin it. “You have two ears and one mouth, use them in those proportions” This is good advice, Setting a strategy in stone and being dogmatic about it will almost certainly be subject to failure. Listen to your teams and be open to adjusting your strategy. Remember that a strategy is tested as it becomes reality and no one will ever have a perfect strategy and the sooner you accept that the better! Taking an ‘Agile’ approach to your strategy will keep it current and relevant. Listening to your ‘partner community’ and validating their concerns will also go a long way to keeping them onboard and never be afraid of bad news, it’s better to know sooner and be able to do something about it than discover all too late that the opportunity has been missed which can often cost you in reputation as well as money. So in summary then I would suggest that success when working with a devolved community comes from your ability to trust them, listen to them, make them feel a part of something special, commend often and of course lead them by your own enthusiasm.